Here is our first tutorial on our Flora Blog Hop tour! Hello! My name is Lisa and I blog over at Love to Color My World...I hope you’ll stop by and say hello! 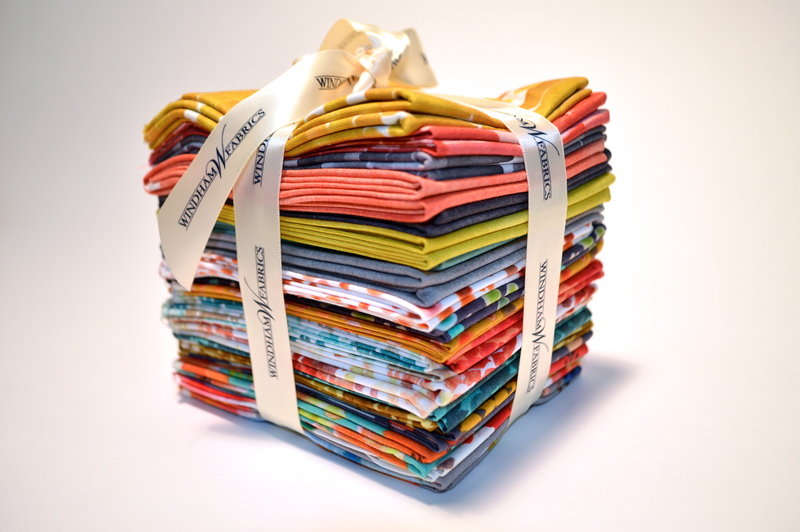 I was super excited to get my hands on a fat quarter bundle of Kelly Ventura’s Flora line. I love the watercolor look of the prints, and the colors really seem to pop. I decided to sew a few table items–four placemats and a runner. Because the fabrics just have a light, summery feel to them, I opted to make these pieces batting free–I simply used a basic pillowcase technique and then topstitched the edges. I wanted to keep these designs simple. 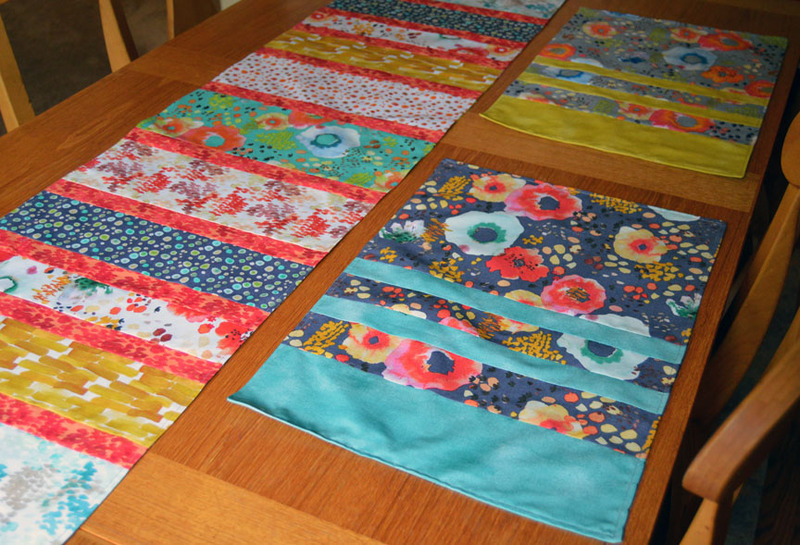 The fabrics, especially the large florals, are so pretty that I didn’t want to cut them up too much. The placemats are truly fat quarter friendly; with careful cutting, two FQs make each placemat. I made the table runner using six FQs, plus scrap from the placemats, plus three FQs for the backing, though yardage would work as well. 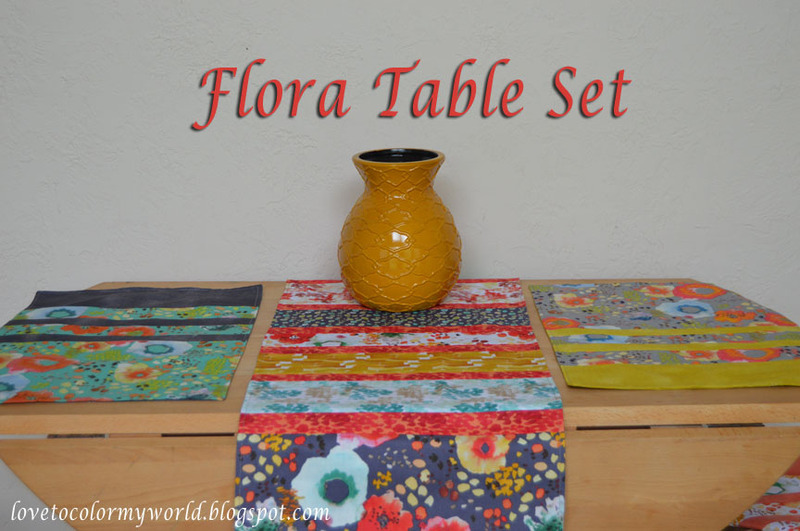 You’ll need 17 Flora fat quarters to make both the placemats and table runner. Each placemat is made with one of the large floral prints and one of the mottled solids. Here’s how I paired them up. 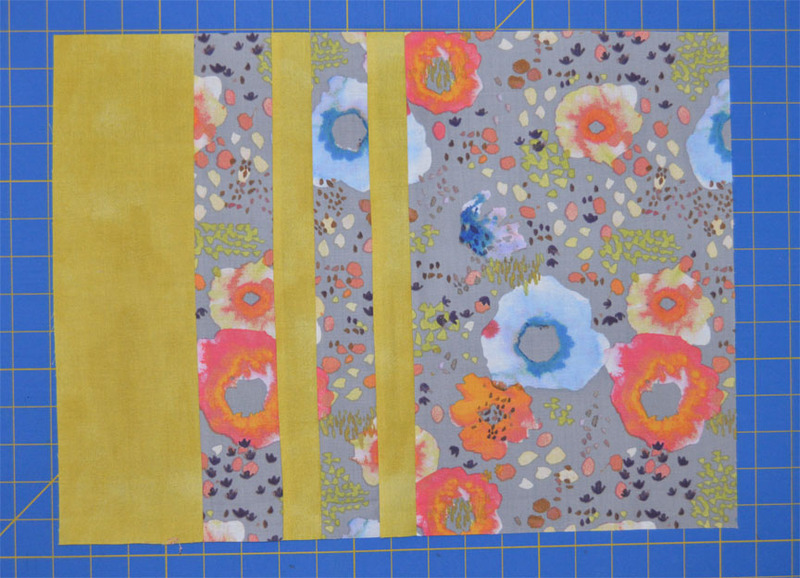 Cut 14″ x 21″ strip from the floral fat quarter. The remainder is scrap. From the strip, cut one 2-1/2″ x 14″ strip, one 2″ x 14″ strip, and one 9″ x 14″ strip. Save the last section of the strip for the table runner. Sew the strips together to make the placemat top. Square up to measure 18-1/2″ wide x 13-1/2″ tall. To finish the placemat, trim the mottled solid backing piece to measure 18-1/2″ x 13-1/2″. Layer right sides together with the placemat top and stitch around all four sides, leaving a 5″ opening for turning. Clip corners, turn right side out, and topstitch around the outer edge with a 1/8″ seam allowance. This will also close the opening. Make three more placemats in the same way. 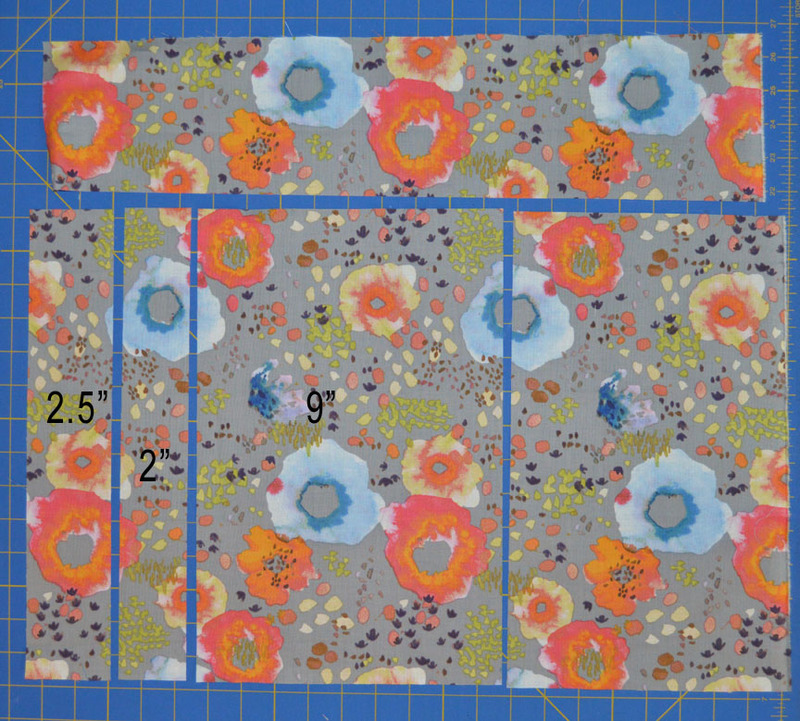 Cut thirteen 1-1/2″ x 14″ strips for sashing–I used the small coral print for mine. You can cut and lay out your pieces randomly, follow my layout, or make up your own. The order of the various sized pieces is simple. 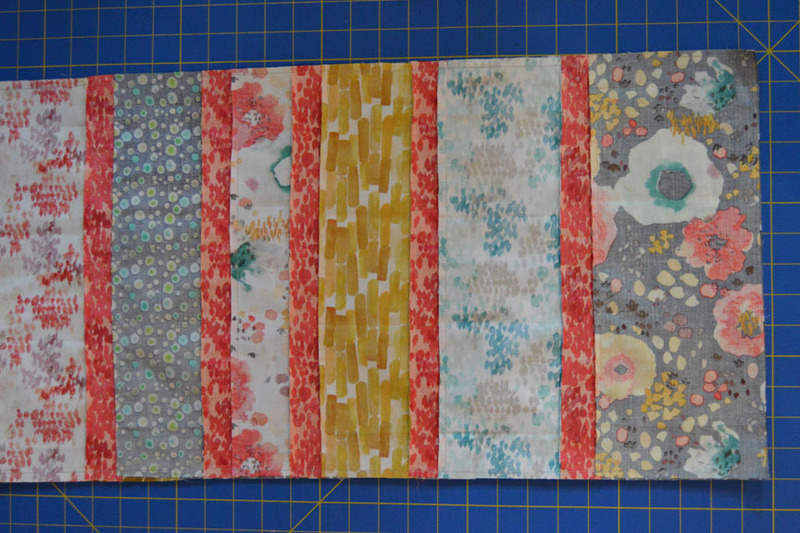 When you’re satisfied with your layout, sew the strips together to make the table runner top. Tip: Don’t press the seams until all the strips have been stitched together. This helps reduce any warping of the narrower strips. Now assemble your backing piece. If you’re using fat quarters, sew three together along the short sides. 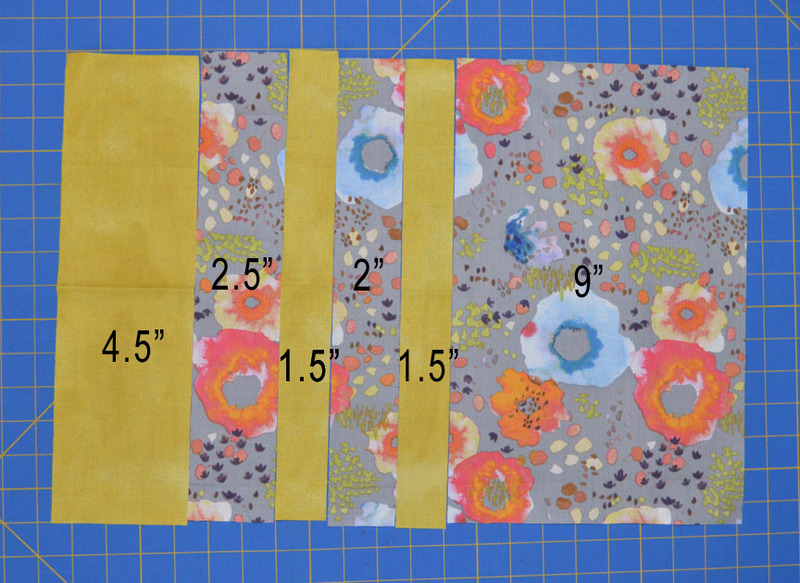 Cut a backing piece to measure 14″ x 59-1/2″. Layer the backing and runner top right sides together and pin. Stitch around all four sides, leaving an opening on one short end for turning. Clip corners, turn right side out and press. Topstitch 1/8″ from runner edges, which will also secure the opening. Enjoy your Flora table setting! My table isn’t nearly as picturesque, but I’d love to use these pieces on a shady porch with tall glasses of lemonade and chicken salad sandwiches. What could be more summery? You, lucky readers now have a chance to win a Fat Quarter bundle of Flora! Be sure to “like” our Facebook page Follow my blog with Bloglovin and comment on this post and tell us what you would do with the bundle! We’ll choose the winners at the end of the blog hop! Good Luck! How can something so beautiful be this easy to create. Love the fabric combinations. Thank you for the tutorial and the giveaway. I would make a quillow with the bundle. 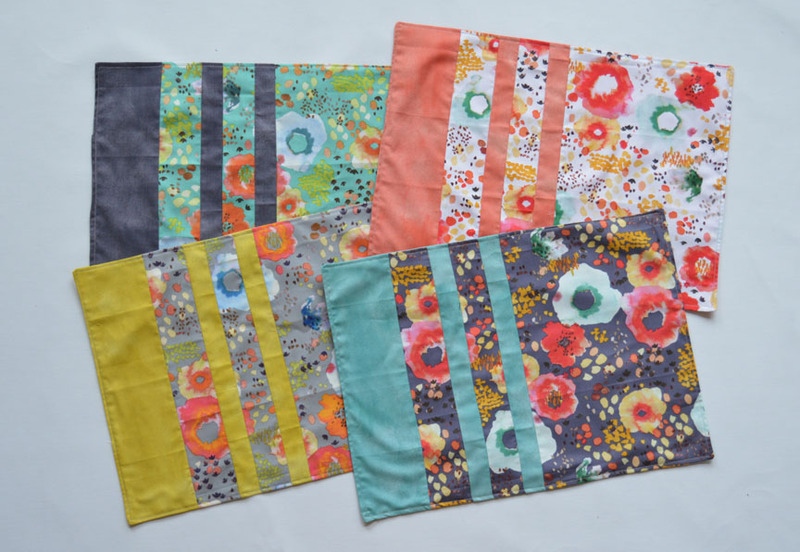 I love your placemats and runner – I might make a picnic quilt!! i would make a watercolor quilt. I would create something for my granddaughter! A bundle would become a lap quilt. Love the flowers on this fabric! Those fabrics are beautiful and the table runner and placemats look great in that fabric! BEAUTIFUL, I’d make a new quilt!!! I love this fabric and your place mats and table runner! I would make these with the fabric. Thanks! What lovely fabric. My Mum has a yellow dining room and these table linens would be perfect for it. I would make a quilt or a bag. Following on bloglovin’. What beautiful fabric! And beautiful creations for a table! I would use this fabric for a lap quilt for my couch. It would bring color and joy into the room! Thanks for the chance to win! I’d like to make a table runner. I like the runner. I would probably make a quilt. I see a lap size no problem. Great colors! Fun tutorial! Thanks! And would love to use this beautiful fabric to make dolls! Lovely fabrics! would make great travel pouches and accent pillows! I follow on Bloglovin! Thanks for the great placemat tutorial! beautiful fabric. i’d like to make a couple of pillow cases for my bed actually and a zipper pouch or 2 and a placemat and mug rug, the options are limitless. I would like to make a tote or a table runner with the bundle. What a gorgeous collection. I love the colors. They are so bright and cheery. I would like to make a lap quilt. I would like to use them for pouches I want to give as gifts this year. I would make a quilt and some pillows. Thanks for the great tutorial. Cute placemats. My kids are so messy, I don’t use placemats. This fabric is super cute. I think that it would make an awesome herringbone quilt or some super fun pillows for my couch.